Harare, Zimbabwe, Jan 22, 2019 / 12:16 am (CNA/EWTN News).- As political protests in Zimbabwe have turned violent and even fatal, reportedly leaving at least 12 people dead, the bishops of the country have called for peaceful resolutions to the crisis. “Zimbabwe is burning; its economy is hurting; its people are suffering. Many ordinary Zimbabweans express disappointment that hoped-for changes are yet to be felt, in access to employment, cash and broad stakeholder consultations. Our quasi currency, operating with multiple exchange rates, is fueling a national crisis,” the bishops said in a Jan. 17 letter. Last week, a sharp spike in fuel prices in Zimbabwe sparked violent protests from members of groups who oppose the current government. According to the BBC, Presidential spokesman George Charamba told local journalists that the opposition group Movement for Democratic Change (MDC) was responsible for the violence. “The MDC leadership has been consistently pushing out the message that they will use violent street action to overturn the results of (last year's) ballot,” Caramba said. However, the United Nations called on the Zimbabwe government to stop using “excessive” force to cull the protests, after reports surfaced that the government was conducting door-to-door searches and beating, torturing and using live ammunition on the protestors. Zimbabwe President Emmerson Mnangagwa announced that he would be returning early from a foreign tour in order to help address the situation. 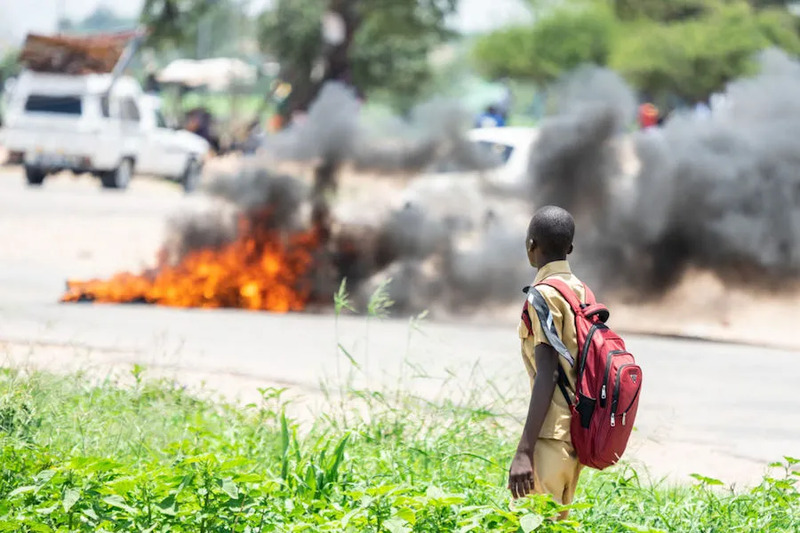 The clashes took place largely in the capital city, Harare, and the southern city of Bulawayo, where looting and riots have been reported and all schools have been forced to close. Reuters reported that more than 60 people were treated for gunshot wounds, following the government’s alleged use of live ammunition on the protestors. News of the protests came despite government blocks on Facebook, Whatsapp and Twitter messaging apps. The government said the blocks were part of an attempt to quell the violence, while human rights groups have said they were attempting to mask human rights violations. The protests come after a long period of political and economic instability, from “the military-assisted political change that took place in November 2017 to the total shutdown of Zimbabwe's major cities and rural trading centres that began on Monday, 14 January 2019,” the bishops said. The bishops said that they are “saddened and concerned” by the government’s failure to stabilize the economy, which has put the livelihood of many Zimbabweans in jeopardy, as well as by the violent riots and demonstrations, the disruption of essential services, and by the government’s intolerance for people expressing opposing views, leading to their torture and even death. “We are writing at a time when our country is going through one of the most trying periods in its history. Once more the resilience and resolve of Zimbabweans is being put to test. We thank the many Zimbabweans who continue to pray ceaselessly for our Country. We, your Shepherds, write to you at this time to help rebuild hope, trust, confidence and stability in Zimbabwe,” the bishops said. They encouraged the government and all citizens of Zimbabwe to help build a free country, with free elections and strong, politically inclusive institutions. “We do not need a strong man or woman but strong institutions. We need to develop a new and challenging kind of politics, a new cooperation and harmony based on reasoned argument, generous compromise and respectful toleration,” they said. The bishops urged the government to work to ease the suffering of the people of Zimbabwe rather than contribute to it, and they urged all citizens towards tolerance and peaceful, nonviolent protests that are within their constitutional rights. “We believe in a God of second chances, who is always offering us new opportunities. Even in the midst of current tensions and disturbances there are new opportunities to rebuild hope, trust, confidence and stability in our country,” they said. Atlanta, Ga., Feb 5, 2018 / 12:00 pm (CNA/EWTN News).- Pope Francis has appointed Marist School principal Father Joel Konzen, S.M., to serve as an auxiliary bishop in the Archdiocese of Atlanta.